Bet you didn't know I was a rock star. 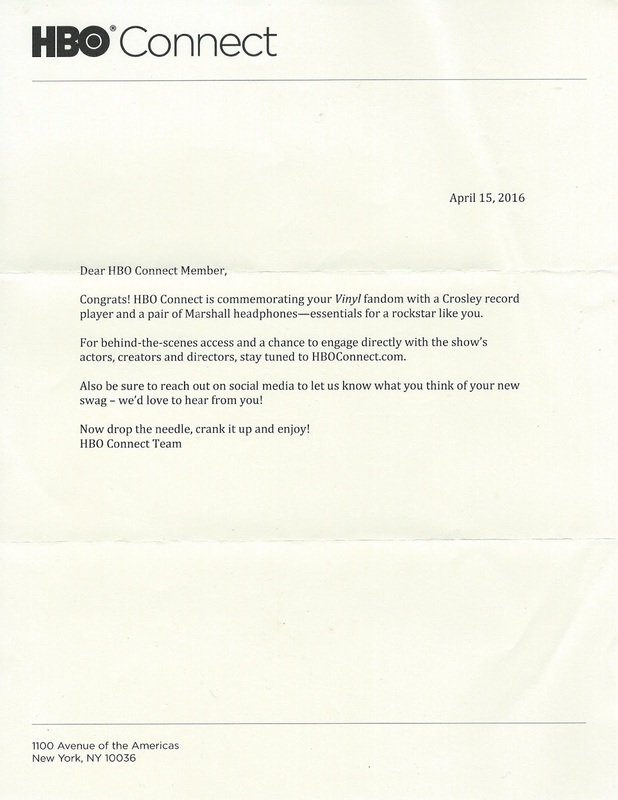 I didn't either until HBO told me so. HBO is the network who produces Vinyl, Game of Thrones, Girls, among other compelling TV productions with cinematic quality. 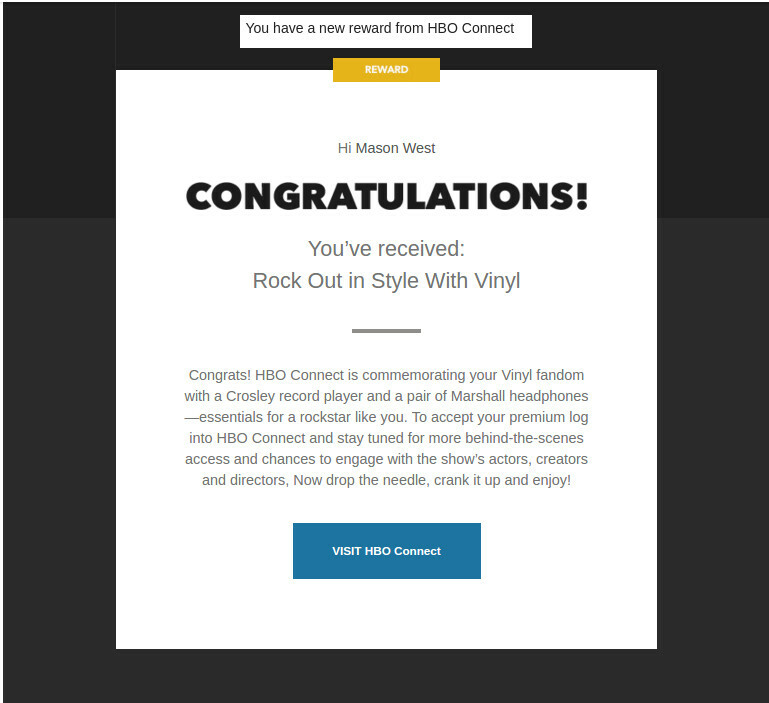 And if HBO says I'm a rock star, who am I to argue? Let's face it, television had been lying brain dead in a glass coffin in the American living room since the 1950s, when suddenly in 1999 this prince named Tony Soprano dashes brazenly in and gives her the sweet waking kiss, and since then the whole forest has come back to life. Television suddenly became smart, entertaining, compelling, and for every show that seized my attention, watching it became a major event in the week. Each episode became something to which I looked forward. Other content producers like AMC have joined with equally compelling programming like Mad Men, Breaking Bad, and Better Call Saul. 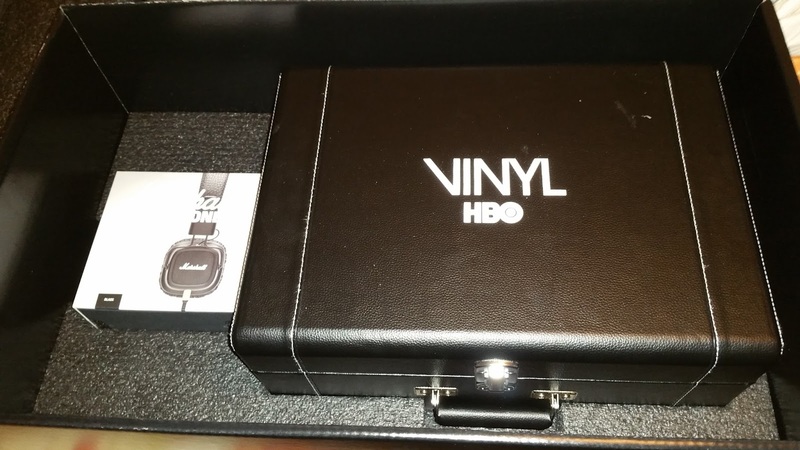 What HBO started has driven the quality up everywhere. Even the "big three" networks, ABC, CBS, and NBC, formerly once a perverse sort of monopoly that dumbed television down to an IQ level below 70, have been forced to make their programming a little more interesting lest they die of starvation. When I became a man, I put away childish television. If I had a TV in my house, it was to watch movies, which for most of my lifetime have been everything that television wasn't. Yes, I heard rumors that Europeans were actually producing intelligent television. Occasionally there was documentary evidence when PBS imported something. And it boggled my brain to think that Ingmar Bergman made mini-series for Swedish television that were subsequently spliced together and circulated in the US as movies (Scenes from a Marriage and Fanny and Alexander, for examples). Sometimes I watched those movies through premium cable channels. Sometimes I didn't have cable and my TV served only as a monitor for my VCR. And finally I sold my TV at a pawnshop and just went to the movie theaters to see movies as they were intended to be seen. It's only been modern miracles of technology like my ROKU box and HBO's reinvention of the movie that has brought me back. 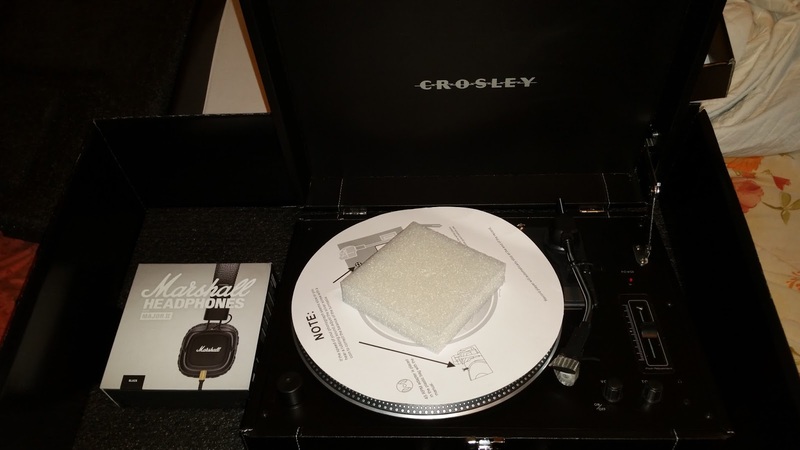 This is absolutely real and you have been gifted a Crosley turntable and a pair of headphones. Our redemption platform is glitching and we are working tirelessly to get it sorted out for you. We appreciate your participation in our community and your patience while we clear this up. 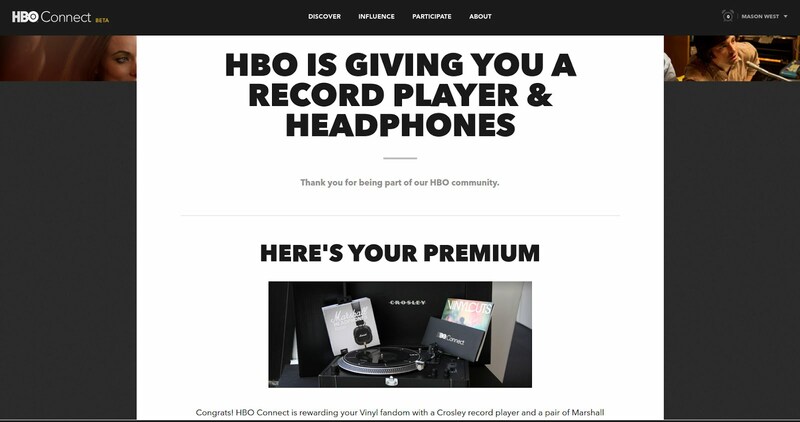 A few days later I got word that they had fixed their Web glitch, so I was able to fill out the winner's form (on the HBO Web site, so I was sure it wasn't a trick, and they didn't ask for my Social Security number or a credit card number). 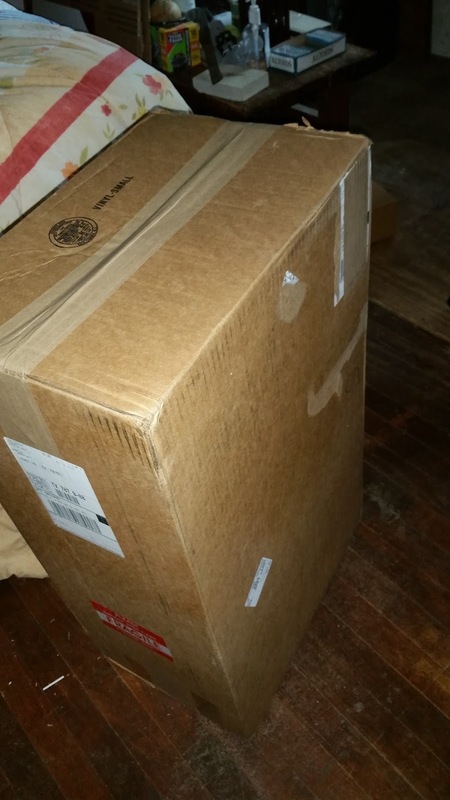 A few days later I got a tracking number, then today, it arrived. UPS brought to my doorstep a surprisingly large box for what I was expecting. Although I have rarely worked with my hands—preferring instead to do the work in my head and to record it on paper or, more lately, bits and bytes—I recently invested in a tool kit. The tool out of which I've gotten the most use is the box cutter. 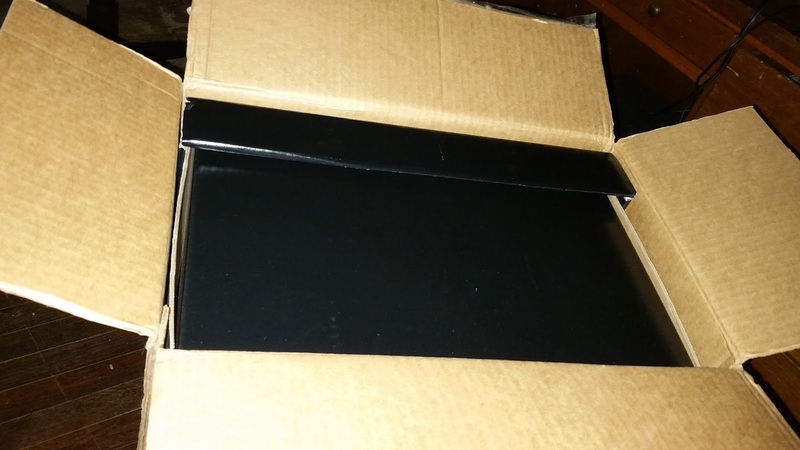 Inside the shipping box I found this elegant ebony-colored box that is too night to throw away. It's a keepsake of the event, and it looks nice. The shipping box, though, is already carved into several flat panels lying at the bottom of my recycling bin. 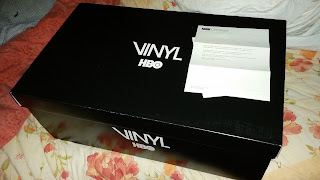 So there was the box in all its palpable, beautiful shiny black cardboard with the VINYL and HBO logos spraypainted on. The letter I found when, on an afterthought, I double-checked the shipping box just in case there was something else. Congrats! HBO Connect is commemorating your Vinyl fandom with a Crosley record player and a pair of Marshall headphones—essentials for a rockstar like you. 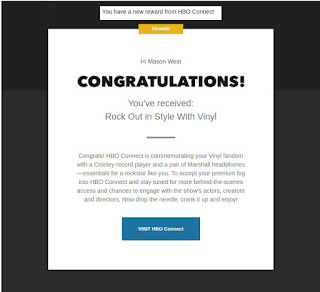 For behind-the-scenes access and a chance to engare directly with the show's actors, creators, and directors, stay tuned to HBOConnect.com. 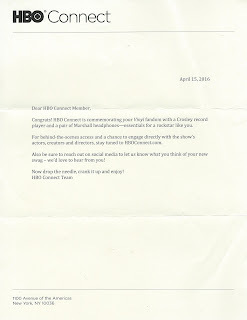 Also be sure to reach out on social media to let us know what you think of your new swag—we'd love to hear from you! 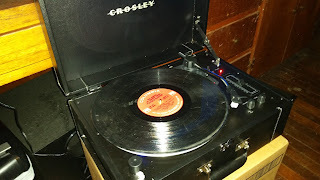 Now drop the needle, crank it up and enjoy! This is the view once you lift the lid off the black box. Things are looking serious now. And this is under the lid of the Crosley, which is portable and looks like a small overnight suitcase. That piece of bread on the turntable is actually styrofoam designed to protect the turntable in shipment. Honestly, I can see spinning some vinyl. To my surprise I've found some records laying around my mother's house, not the least of which is It's a Beautiful Day's eponymous first album. 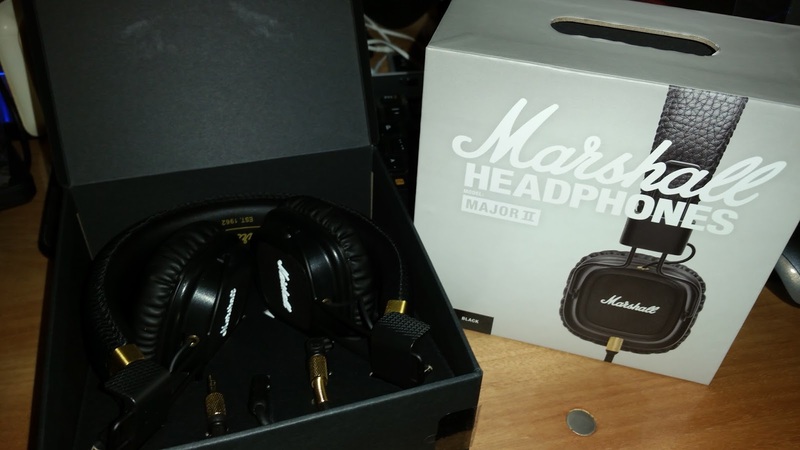 But I use headphones in almost everything I do, and a good quality set like these Marshall's are as practical for me as they are supercool. 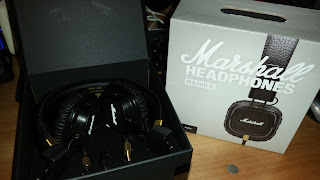 The last pair of supposedly decent headphones that I had were these Sony headphones made to work with the Playstation 4, but they lasted only a couple of weeks. Information that I gathered in advance about the Marshall phones tells me they won't have Sony's problem ever (Sony should have had a recall, but they're still selling them). HBO's extravagance has come because of HBO's Vinyl. It's a great show that's recently had its season finale, but it's still available for on-demand streaming. Among the creative forces driving this show are director Martin Scorsese, who directed the first episode and whose influence is visible throughout, and Rolling Stones front man Mick Jagger, who must be an amazing source of stories from the NY rock scene. I expected much from Vinyl, but the show has exceeded my expectations. 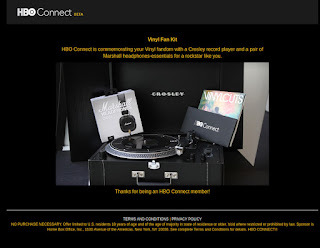 Vinyl is authentic historical fiction: the story revolves around American Century Records, a fictional record company, and especially its senior partner, Richie Finestra (Bobby Cannavale), but the authentic 1970s New York City backdrop is peopled with the likes of Andy Warhol (John Cameron Mitchell) and the whole Factory scene, Lou Reed (Connor Hanwick), John Lennon (Stephen Sullivan) and even May Pang (Celia Au) during that period when Yoko Ono kicked John out of the house, but not before setting him up with an interim girlfriend. Alice Cooper (Dustin Ingram) has an extended part as he leads on one of the record company's A&R men. The A&R man wants to steal the band away from their current label, but Alice Cooper was wooed by Richie Finestra himself back in the days that the band was starving. Finestra stood them up when they had spent their pennies trying to get to a concert signing. Now Alice Cooper is just enjoying a bit of revenge by toying with the earnest young A&R man. Cannavale as Finestra, the sometimes on-the-wagon, sometimes coked-up president of the company, does a wonderful job of portraying a man who, despite his partly cloudy consciousness, harnesses the horses of rock & roll's chaos and manages to pull success out of a free-for-all and music out of cacophony. Olivia Wilde plays Devon, Finestra's wife, who was a once and future member of the Warhol Factory crowd. When Finestra lets her down, she goes proactive and starts building a new life and rebuilding some of her old connections. Ray Romano plays the second partner who has a serious love/hate relationship with Finestra. They're old friends that go a long way back and have been through a lot together. Sometimes they screw each other over, but they also know each other well enough that they forgive each other, so there's a power seesaw going on there. It's refreshing to me to see Romano playing a more dramatic role than he had in Everybody Loves Raymond—he's quite good at it. Juno Temple plays Jamie Vine, an aggressively ambitious and resourceful woman playing every card she can find to overcome the sexism of the time and the industry to bring the A&R department talent instead of just sandwiches and drugs. She's a character with lots of room for growth as she learns the business blind and does some growing up along the way, and that puts a lot of drama in Temple's court, and she handles it well.